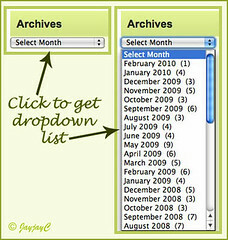 I’m absolutely thrilled to have been able to get a dropdown monthly archive at the sidebar finally! This display is so very short, just perfect to replace the default one that was getting way too long, which will continue growing in length as long as new posts are being added. Learn how to change that here! A big thank you to Michael Martin of Pro Blog Design for his awesome tip on how to get this dropdown list! Click Update File to save edit and you’re done! Easy, huh! Check further at WordPress Codex to learn other various ways to display archives list on your website. Do check this recent article about creating an Archives page, using the WP_Archives plugin, if you’re interested to improve further. It’s truly a wholesome alternative way to have your archived posts with titles and dates automatically generated, with links that are beautifully displayed too. Thanks so much for the offer, Michael. You’re a gem! Have a lovely Friday and wonderful weekend ahead.